MonsterSlayer.com - Bench Tools & Equip. Made from Arkansas stone powder, solidified by fire. Has more cutting action than regular Arkansas stones. Bench stone can be used on both sides with oil. 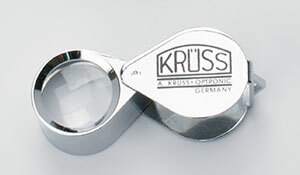 High quality inexpensive single lens loupe. 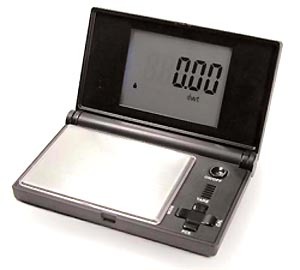 Resolution: in 0.1 gram - Tare function - Plus a parts counter! Weighs: Grams, Ounces, Pennyweights (DWT) & Troy Ounces. 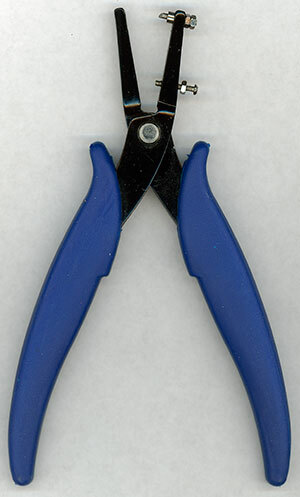 Wrap this tough, woven, slightly sticky tape around your fingers before buffing, for safety against cuts and abrasions. to provide a good firm grip on your design and chasing stamps while striking them. 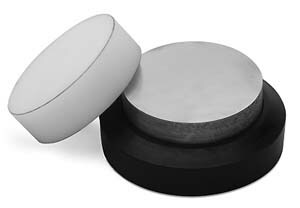 plus a round block of solid steel that is 15/16" (24mm) thick and 3" (75mm) in diameter. The third piece is a sturdy round nylon block the same size that fits into the rubber base for lighter, more delicate work. Tip: Always use one face for stamping and shaping to keep the opposite face clean and unmarked for smoothing your work piece. Use a large file to shave high spots from the stamping face from time to time. 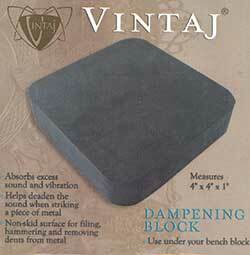 Use under your bench block. Absorbs excess sound and vibration. 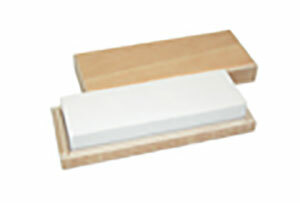 Non-skid material for filing and hammering. 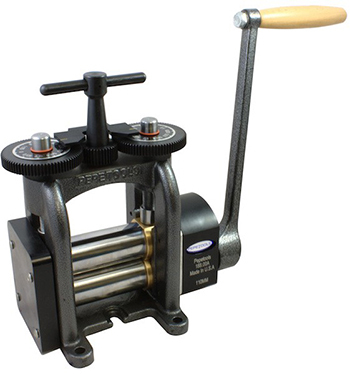 ideal resilience when texturing, letter imprinting, riveting, and more!" Measures 4-1/2" from tip to tip and is 1-5/8" high. A riveting hole is provided on top. Machined from a solid block of tool steel and case hardened. 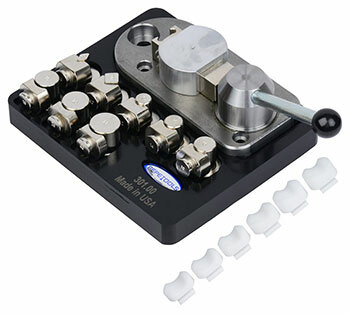 Two different hole sizes, 1.6 mm (1/16") and 2.3 mm ( 3/32") screw punches. Made with tool steel dies, will make perfectly formed holes in soft metal up to 24 Ga. without deforming metal. 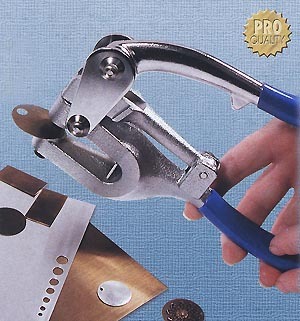 Punches a 1.5 mm hole squarely through soft sheet metals up to 20 gauge. 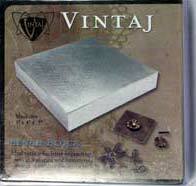 Creates a smooth hole with no rough edges or burs in the sheet. Coil spring return. Replacable shear pin. with sturdy plastic storage case. Punches through soft sheet metals up to 16 gauge. Throat depth is adjustable from 1/4" to 1-1/2"
Screw bolts to bench top. 1" wide smooth jaws. 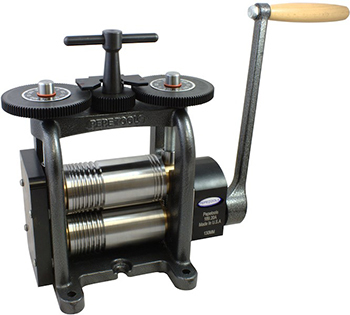 a large vise for small holding jobs. Portable aluminum & steel construction. 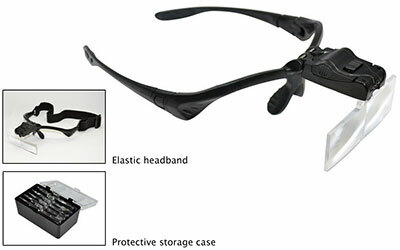 Smooth jaws opens up to 2 inches wide. One jaw has a horizontal "V' groove good for holding heavy wire or tubing. 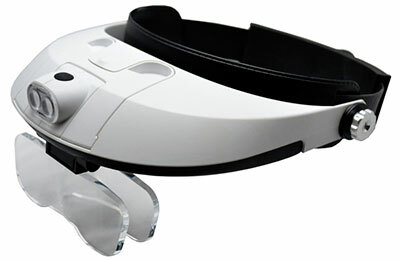 Plus a set of slip-on rubber jaw pads to prevent marring soft materials. Fully adjustable ball type joint allows 360* swivel and up to 90* layover. Clamps on up to 2" thick bench top. A no-mar table top pad also included. Cast Steel with 2-3/4x 3-1/4 machined top. Clamps onto table top. REPLACEMENT PIN for bench pin & anvil combos above. 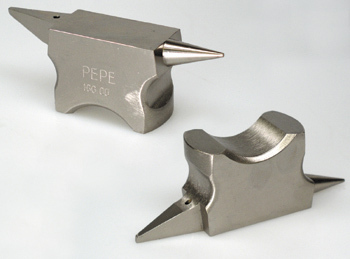 See our Mandrels page for a bracelet mandrel (TL-MAN-BRTO) that can be inserted into these bench anvils. GERMAN BENCH PIN 2.5" X 6-3/4" Pin size - Clamps onto almost any table top. Proudly manufactured in the USA, Pepetools is proud to announce a new addition to the Designer Series of guillotine shears. 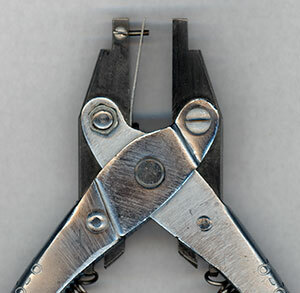 Thanks to innovative features and an intuitive design, this shear is a pleasure to use. Unlike other horizontal style units available on the market, the Pepetools 6" Shear features a perpendicular handle that allows the operator to maintain full control of the cutting process. In addition to the perpendicular handle, the unit also features a large 10" x 7" feeder table that doubles as a miter box. The blades are the heart of the machine, 6.25" in length allowing full 6" sheets to be cut. Each blade is manufactured from high grade tool steel, afterwards it is heat treated to 45-50HRC. 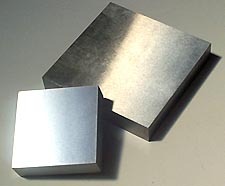 Heat treatment is necessary to harden the material, ensuring a lifetime of use. The stationary blade is sharpened to correspond with the compound angle ground into the moving blade. Our proprietary method produces a set of blades that are good for up to 10,000 cuts. On the receiving side of the unit there is a material stop. This stop can be adjusted to cut from as little as 1MM all the way up to 6" (152MM). 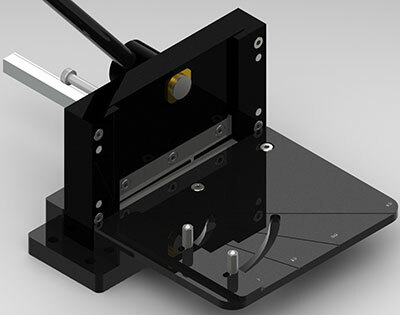 The stop can be adjusted to ensure repeated cuts of consistent length.